You could win a trip for four to the FIFA Women’s World Cup 2019™ Final match in Lyon, France, thanks to Visa. 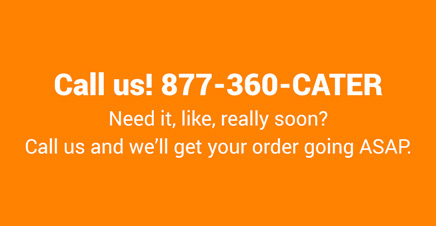 App/online ordering available at participating restaurants. Allow 15 minutes for pickup. 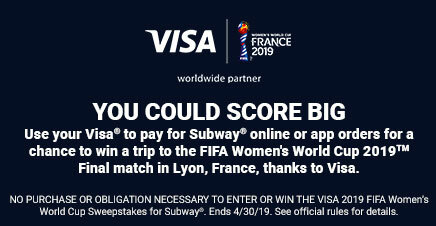 ELIGIBILITY: The Visa 2019 FIFA Women’s World Cup Sweepstakes for Subway (“Sweepstakes”) is open only to legal residents of the fifty (50) United States and District of Columbia who are 18 years of age or older as of March 25, 2019. Commercial card eligibility is subject to employer policies regarding sweepstakes participation. Void in Puerto Rico and where prohibited. Employees of Visa U.S.A. Inc. (“Sponsor”), Visa Inc., Visa International Service Association, Subway Franchisee Advertising Fund Trust Ltd. (“SFAFT” and/or “Promotional Participant”) and its franchisees, and their respective affiliated entities, parents, successors, affiliates, subsidiaries, trustees, and client financial institutions, prize suppliers, and advertising and promotion agencies, Don Jagoda Associates, Inc., and each of their respective agents, representatives, officers, directors, shareholders, and employees, and each of their immediate family members (spouse, parents, children, siblings, and their respective spouses, regardless of where they live) and individuals living in the same households of each of these individuals, whether related or not, are not eligible to enter or win. Sweepstakes is subject to all applicable federal, state, and local laws. The Sweepstakes is governed by U.S. law. SWEEPSTAKES TIMING/DESCRIPTION: Begins at 12:00:00 AM Pacific Time (“PT”) on March 25, 2019, and ends at 11:59:59 PM PT on April 30, 2019 (“Promotion Period”). There will be one (1) Grand Prize winner selected in a random drawing at the end of the Promotion Period from among all eligible entries received. 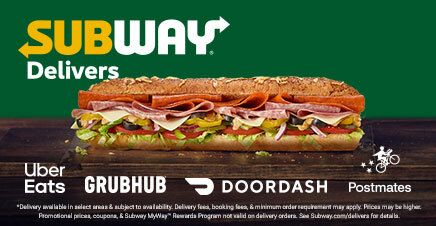 AUTOMATIC ENTRY: An eligible Visa cardholder will automatically receive one (1) Sweepstakes entry for each purchase made using their Visa card through the Subway® application (“App”) or at www.order.subway.com (“Website”) for Subway® product(s) sold at participating Subway® locations in the U.S., during the Promotion Period. (You can download the app to your web-enabled device for free from the Apple store or Google Play.) Only eligible purchases made with a Visa card that is not in default under the customer agreement for that account and issued by a participating financial institution in the U.S., processed through Visa U.S.A. Inc.'s transaction-processing system during the Promotion Period, are eligible for automatic entry. In the event of a dispute as to who submitted a particular cardholder entry, such entry will be deemed to be submitted by the primary person in whose name the card used to enter the Sweepstakes was issued. Purchases made with a Visa card through PayPal on the App or Website are not eligible purchases and are ineligible for automatic entry. Visa cards or card numbers that are stolen, fraudulent, tampered with, or otherwise altered are not eligible for automatic entry. Automatic entries must be made by April 30, 2019 in order to be included in the random drawing. TO ENTER BY MAIL WITHOUT PURCHASE OR OBLIGATION: Hand-print your complete name, street address, city, state, ZIP code, and daytime and evening telephone numbers (including area code) on a plain piece of 3" x 5" paper, and mail it in a business-size (#10) envelope with sufficient postage affixed, to: Visa 2019 FIFA Women’s World Cup Sweepstakes for Subway, P.O. Box 7703, Melville, NY 11775-7703. Mailed entries must be postmarked between March 25, 2019 and April 30, 2019, and received by May 7, 2019, in order to be included in the random drawing. Enter as often as you wish; however, each mailed entry will count as one (1) entry into the random drawing and must be mailed in a separate, postmarked-and-stamped envelope. Entries that are mechanically reproduced, copied, illegible, incomplete, or inaccurate and entries by any means which subvert the entry process are void. Entries become the property of the Sponsor and will not be acknowledged or returned. Incomplete entries or entries not complying with these Official Rules are subject to disqualification, at the Sponsor’s sole discretion. Proof of mailing does not constitute proof of delivery. DETERMINATION OF WINNER/WINNER NOTIFICATION: One (1) potential Grand Prize winner will be selected on or about May 24, 2019 from among all eligible automatic and mailed entries received. Random drawing will be conducted under the direction of Don Jagoda Associates, Inc. (“Judge”), an independent judging organization. Judges’ and Sponsor’s decisions are final and binding on matters relating to this Sweepstakes. Potential Grand Prize winner will be notified by overnight or U.S. Mail, and/or telephone/email, within one (1) week of random drawing date. Potential Grand Prize winner will be required to sign an affidavit of eligibility/liability release, a publicity release where legal, and return these properly executed documents via fax within five (5) days of notification. Non-compliance within this time frame and/or with these Official Rules; Sponsor’s inability to contact potential winner within a reasonable time period; or prize or prize notification returned as undeliverable will result in such potential winner’s disqualification and, at Sponsor’s discretion, the prize may be awarded to a potential alternate winner. ODDS: Estimated odds of winning the Grand Prize are 1 in 900,745; however, the actual odds of winning depend upon the total number of eligible entries received. PRIZE & APPROXIMATE RETAIL VALUE (“ARV”): One (1) Grand Prize: A trip for winner and up to three (3) guests (July 5, 2019 – July 9, 2019), to attend the FIFA Women’s World Cup France 2019™ Final match (“Final match”) in Lyon, France, on July 7, 2019. Prize includes round-trip economy class air transportation for up to four (4) people from a major U.S. gateway airport nearest the winner’s home to Lyon, France, ground transportation from/to airport/hotel in Lyon, four (4) nights’ hotel accommodations (one room, quad occupancy), four (4) admission tickets to the Final match, daily breakfast at hotel for four (4) people for five (5) days in Lyon, a Visa® prepaid product valued at 800 Euro for the winner only, a Sponsor-specified gift and ground transportation from/to hotel/scheduled activities for four (4) people. Grand Prize will also include $11,000 (awarded in the form of a check) to the winner that can be used toward the payment of income taxes associated with the prize. ARV: $36,500. No substitution, cash equivalent, or transfer of prize permitted except at the sole discretion of the Sponsor, who reserves the right to substitute the prize (or portion thereof) with one of equal or greater value, except as otherwise provided herein. Any and all other costs and expenses associated with prize acceptance and use not specifically stated within these Official Rules as being provided, are the sole responsibility of the winner, including, without limitation, all federal, state, and local taxes, additional transportation and meals, luggage fees, gratuities, and souvenirs. If Grand Prize winner is at least 18 but still considered a minor in his/her jurisdiction of residence, prize may be awarded in the name of his/her parent or legal guardian, who will be responsible for fulfilling all requirements imposed on winner as set forth herein. Such parent or legal guardian may also be required to accompany minor winner on trip. All terms & conditions apply to Visa Prepaid product. Prize details are at Sponsor’s sole discretion. Actual value of trip depends upon the city of departure, time of travel, any airfare fluctuations and or current market conditions at time of prize fulfillment, and any difference between the stated ARV and the actual value if any, will not be awarded. Trip must be taken on dates specified by Sponsor; Dates of departure/return are subject to change by Sponsor. Winner’s guests (or winner, on behalf of minor guests) must execute and return a liability/publicity release. All travelers must possess valid travel documents (e.g. valid U.S. passport valid for at least 3 months after trip is completed) prior to travel. Winner and guests must travel on same itinerary. Guests of winner must be of legal age of majority in their jurisdiction of residence (and at least 18) unless they are children or legal wards of winner; then winner will be required to execute and return such documents on behalf of such children or legal wards. Trip is subject to air/hotel availability and other conditions and restrictions. Airline/flight times to be selected by Sponsor at its sole discretion; one or more stopovers may be required. Once trip has been booked, no change, extension or substitution of trip dates is permitted except by Sponsor, in its sole discretion. Sponsor will not replace any lost or stolen tickets, travel vouchers or similar items once they are in winner’s possession or in the possession of a guest. Sponsor, Visa Inc., Visa International Service Association, Subway IP LLC, SFAFT, Doctor’s Associates LLC, Franchise World Headquarters, LLC, Subway Restaurants and Subway® franchisees, and their respective affiliated entities, parents, successors, affiliates, subsidiaries, trustees, and client financial institutions, prize suppliers, and advertising and promotion agencies, Don Jagoda Associates, Inc., and each of their respective agents, representatives, officers, directors, shareholders, and employees (“Releasees”) shall not be responsible for any cancellations, delays, diversions, substitutions, or any acts or omissions whatsoever by the air carrier(s), hotel, or other transportation companies or any other persons providing any of these services and accommodations to passengers, including any results thereof, such as changes in services or accommodations necessitated by same. Prize conditions may be added or modified by companies providing those portions of the prize. The prize restrictions/conditions stated herein are not all-inclusive and may be subject to additional restrictions/conditions, which may be stated in the affidavit and release and/or prize travel documents. Winner and guests are responsible for obtaining travel documents as well as travel insurance (and all other forms of insurance), that they may wish to obtain for the trip (at their own expense) and hereby acknowledge that the Releasees have not and will not obtain or provide travel insurance or any other form of insurance for the trip. Winner and guests must comply with all venue, stadium, and event rules and regulations. Failure to do so may result in forfeiture of such portion(s) of prize. Sponsor reserves the right to remove or deny entry to winner and any guest who engage in a non-sportsmanlike or disruptive manner, or with intent to annoy, abuse, threaten, or harass any other person at the Final match. If any portion of prize or any other event or activity is unable to take place as planned for any reason, including but not limited to, cancellation, scheduling conflicts, lockout, labor dispute, strike, inclement weather, or an event of force majeure, the remaining components of the prize will be awarded and Sponsor’s obligation to the winner will be fulfilled, and no other additional compensation or substitution will be provided. In the event the Grand Prize winner or his/her guests (who are 21+) consume alcoholic beverages (not provided by Sponsor) while participating in any Grand Prize related activities, they do so at their own discretion and agree to hold the Released Parties harmless from any subsequent damages or third-party claims arising out of or related to such consumption. CONDITIONS OF PARTICIPATION: By entering, entrants agree to be bound by these Official Rules, including all eligibility requirements and the decisions of the Sponsor and Judge, which are final and binding. By accepting prize, winner consents to the use of his/her name, image, likeness, photograph, voice, and biographical material for advertising, publicity, and promotional purposes by Sponsor, its client financial institutions and merchants, and each of their respective agents, licensees, successors and assigns, in any and all media now or hereafter devised, including but not limited to, any online announcements, worldwide in perpetuity, without additional compensation, notification, or permission, except where prohibited by law. Entrants release and hold harmless Releasees from any claims, actions, injury, loss, or damage of any kind, including but not limited to, personal injury or death, resulting, directly or indirectly, in whole or in part, from participating in this Sweepstakes or from the acceptance, possession, or use or misuse of the prize (including any travel/activity related thereto). This limitation of liability is a comprehensive limitation of liability that applies to all damages of any kind, including (without limitation) compensatory, direct, indirect, or consequential damages; loss of data, income or profit; loss of damage to property; and claims of third parties. Entrants agree that Releasees have not made nor are in any manner responsible or liable for any warranty, representation, or guarantee, statutory, express or implied (including but not limited to, the implied warranties of merchantability, title, and fitness for a particular purpose), in fact or in law, relative to the Sweepstakes. GENERAL: Sponsor will collect information from the entrants solely for the purpose of the prize drawing and to notify a winner. Sponsor will not share this information with any third party (except as necessary for the administration of the Sweepstakes), nor attempt to contact entrant, unless entrant has agreed to receive further information on Sponsor’s products and promotions. Releasees are not responsible for lost, late, illegible, misdirected, inaccurate, incomplete, undelivered, damaged, delayed, garbled, postage-due, or stolen mail, entries, and transactions; for transactions that are lost, misdirected, or fail to enter into the processing system, or are processed, reported, or transmitted late or incorrectly; for any problems or technical malfunctions of any telephone network or lines, computer online systems, servers or providers, computer equipment, software, failure of any electronic entry to be received on account of technical problems or traffic congestion on the internet or on any website/app or any combination thereof, including any injury or damage to participant's or any other person's computer related to, or resulting from, participation in or downloading any Sweepstakes materials, or for any other errors or problems of any kind, whether typographical, printing, mechanical, human, electronic, or otherwise, relating to or in connection with the Sweepstakes, including, without limitation, any error or problem that may occur in connection with the administration of the Sweepstakes, the processing of entries, the announcement of the prize, the trip, or any trip-related event, winner’s inability to participate in the trip, or in any Sweepstakes-related materials. Entry materials that have been tampered with or altered are void. Sponsor reserves the right, in its sole discretion, to cancel or suspend part or all of this Sweepstakes at any time without notice and for any reason including, if in the Judge’s opinion there is any suspected or actual evidence of electronic or non-electronic tampering with any portion of the Sweepstakes, or if virus, bugs, non-authorized human intervention or other causes corrupt or impair the administration, security, fairness, or integrity and proper play of the Sweepstakes. In the event of cancellation, Sponsor may void any entries it suspects are at issue and, at its discretion, if terminated, award prize in a random drawing from among all non-suspect, eligible entries received up to the date of cancellation. Caution: Any attempt by an entrant or any other individual to damage the Website/app website in the Sweepstakes or undermine the legitimate operation of the Sweepstakes may be in violation of criminal and civil laws and, should such an attempt be made, the Sponsor reserves the right to seek any and all remedies available from any such person to the fullest extent permitted by law, including criminal prosecution. Sponsor’s failure to enforce any term of these Official Rules shall not constitute a waiver of that or any other provision. Sponsor reserves the right to disqualify entrants who violate these Official Rules or interfere with this Sweepstakes in any manner. DISPUTES: Except where prohibited, all issues/questions concerning the construction, validity, interpretation, and enforceability of these Official Rules, or the rights and obligations of the entrant and Sponsor in connection with the Sweepstakes, shall be governed by, and construed in accordance with, the laws of the State of California, without giving effect to any choice of law or conflict of law rules (whether of the State of California or any other jurisdiction) that would cause the application of the laws of any jurisdiction other than the State of California. Jurisdiction and venue shall be solely within the State of California. ARBITRATION: Except where prohibited by law, as a condition of participating in this Sweepstakes, participant agrees that (i) any and all disputes and causes of action arising out of or connected with this Sweepstakes, or prize awarded, shall be resolved individually, without resort to any form of class action, and exclusively by final and binding arbitration under the rules of the American Arbitration Association and held at the AAA regional office nearest the participant; (ii) the Federal Arbitration Act shall govern the interpretation, enforcement and all proceedings at such arbitration; and (iii) judgment upon such arbitration award may be entered in any court having jurisdiction. Under no circumstances will participant be permitted to obtain awards for, and participant hereby waives all rights to claim, punitive, incidental or consequential damages, or any other damages, including attorneys' fees, other than participant's actual out-of-pocket expenses (i.e., costs associated with participating in this Sweepstakes), and participant further waives all rights to have damages multiplied or increased. WINNER’S NAME: For the name of the Grand Prize winner, available after June 30, 2019, mail a self-addressed, stamped envelope by May 31, 2019, to: Visa 2019 FIFA Women’s World Cup Sweepstakes for Subway Winner, c/o Don Jagoda Associates, Inc., 100 Marcus Drive, Melville, NY 11747. SPONSOR & ADMINISTRATOR: Sponsor: Visa U.S.A. Inc., P.O. Box 8999, San Francisco, CA 94128-8999. Administrator: Don Jagoda Associates, Inc., 100 Marcus Drive, Melville, NY 11747. CONSUMER DISCLOSURE: NO PURCHASE OR OBLIGATION NECESSARY TO ENTER OR WIN. A PURCHASE WILL NOT INCREASE YOUR CHANCES OF WINNING. No entrant has yet won. A trip for winner and up to three (3) guests (7/5/19-7/9/19), to attend the FIFA Women’s World Cup France 2019™ Final match (“Final match”) in Lyon, France on July 7, 2019. Prize includes round-trip economy class air transportation for up to four (4) people from a major U.S. gateway airport nearest the winner’s home to Lyon, France, ground transportation from/to airport/hotel in Lyon, four (4) nights’ hotel accommodations (one room, quad occupancy), four (4) admission tickets to the Final match, daily breakfast at hotel for four (4) people for five (5) days in Lyon, a Visa prepaid product valued at 800 Euro for the winner only, a Sponsor-specified gift and ground transportation from/to hotel/scheduled activities for four (4) people. Grand Prize will also include $11,000 (awarded in the form of a check) to the winner that can be used toward the payment of income taxes associated with the prize. ARV: $36,500. Automatic entries must be received by 11:59:59 PM PT 4/30/19 in order to be eligible. Mailed entries must be postmarked by 4/30/19 and received by 5/7/19. Estimated odds of winning are 1 in 900,745, however the actual odds of winning depend upon the total number of eligible entries received. Sweepstakes ends 11:59:59 PM PT 4/30/19. See Official Rules above for complete details, including prize restrictions. Sponsored solely by Visa U.S.A. Inc., P.O. Box 8999, San Francisco, CA 94128-8999.